The importance of homocysteine as a marker for health and wellbeing is becoming clearer. Raised blood homocysteine concentrations may predict the development of heart problems in older people even better than any usual measure of risk including cholesterol, blood pressure or smoking. Women with high homocysteine levels find it harder to conceive and are at risk from repeated early miscarriage. The good news is raised homocysteine levels can usually be brought back to normal levels by simple dietary changes and / or supplementation with B vitamins. However, everyone is unique and different factors, including genetics, make it virtually impossible to determine an individuals’ nutritional requirements without assessing levels of homocysteine first, and then monitoring dietary changes to ensure that acceptable homocysteine levels are reached. The Lorisian Homocysteine test is a quick and easy home-to-laboratory test that delivers reliable laboratory test results within just 10 days*. Homocysteine measurement does not give a definitive diagnosis of increased risk of these conditions and any symptoms or concerns must be checked out by a Medical Professional before carrying out the test. * Results may take longer than 10 days for customers outside of the UK. If the results came back indicating that you have no food intolerances then you are reimbursed the purchase price less a £20 administration fee. 1 x Customer details form. *customers outside of the UK will need to pay postage. LORISIAN Homocysteine Test - Test Kit should be taken before eating anything first thing in the morning. Complete the customer details form enclosed with your kit box. Wash your hands thoroughly in warm water and dry. Remove the plasma separator from the foil pouch. Retain both items for later. Wipe the top of your finger or thumb with the antiseptic wipe and allow to dry. Pull the cover off the lancet twisting it slightly while pulling. Remember to take the blood sample before eating anything first thing in the morning. Place the lancet on your finger or thumb and press the purple part of the lancet down. This will release the lancet to pierce your skin quickly. Whilst standing up hold hand at waist level (or lower than heart) and massage your finger or thumb from base to tip to produce a larger droplet of blood. Apply 3 to 6 large drops of blood into the centre of the large hole, allowing each droplet to soak through. Continue adding blood, 1 drop at a time, until it no longer soaks through. When sufficient blood has been applied, a blue colour will develop in the small hole (to the right), The blue colour should develop after 1 minute. If not, apply further blood droplets until it becomes visible. Wait 5 minutes and then slowly peel off the top layer of the plasma separator, ensuring the dis with the blue dot is present on the lower card. If you can see a black X then the disc is stuck to the underside of the top sticker. Clearly write your name and state the date the sample is taken on the base card. Discard the top layer of the separator safely. Allow to dry for 15 minutes and then place the plasma separator back into the foil pouch for added protection. Please ensure you do not touch the disc that has turned blue. Using the prepaid envelope provided, post immediately to Lorisian (customers outside of the UK will need to pay postage). Should only be used by an adult. Lancet is for individual use and should not be used with others. Use caution when handling blood. Return used lancet in the kit box provided for safe disposal. Suffering from blood borne diseases such as Hepatitis or HIV. Under the age of 2. Below are reviews of LORISIAN Homocysteine Test - Test Kit by bodykind customers. If you have tried this product we'd love to hear what you think so please leave a review. 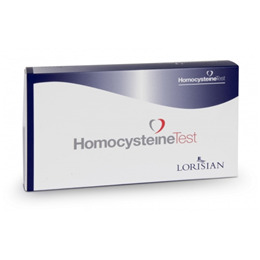 The Lorisian Homocysteine test is a quick and easy home-to-laboratory test that delivers reliable laboratory test results within just 10 days. The importance of homocysteine as a marker for health and wellbeing is becoming clearer.